COLUMBIA SPY: Is Columbia racist? This is an isolated experience. Columbia is home of the underground railroad. Columbians helped slaves gain freedom. We are not racist here. Not exactly the ho, but one stop on the "railroad." "The Underground Railroad is a term for the covert network of people and places that assisted fugitive slaves as they escaped from slavery in the South." 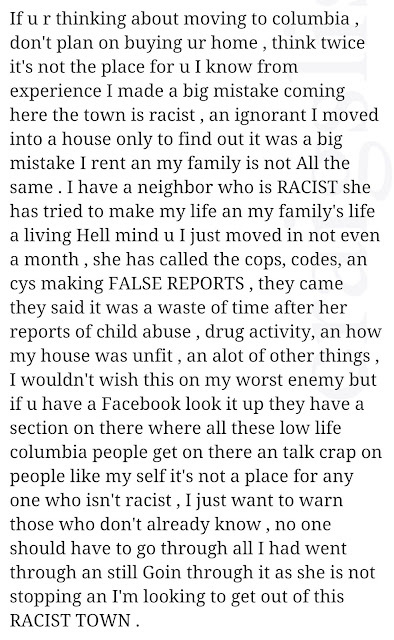 Columbia a racist town huh..Well you just happened to gain a very assanine neighbor which happens. No need to throw the race card at this one. 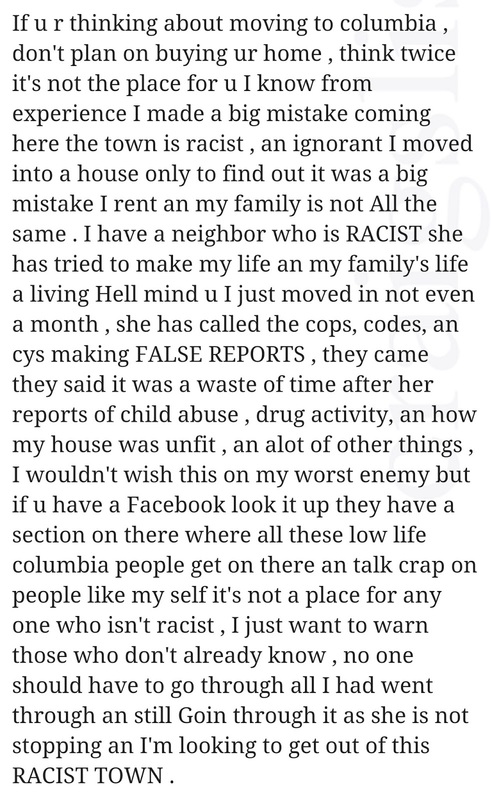 I grew up in columbia and I haven't met a single racist person in that town ever. Now not saying there isn't but from my point of view from the age 11 until 30 not once. I agree this is an isolated incident. Columbia's reputation of being looked down upon historically came in part from it's integrated lifestyle. While the rest of the county was segregated Columbia was not! I have nothing against a mixed race family, but I do have a hard time taking someone seriously who doesn't know how to use spell check or grammar check on a computer before making a post that many will see. I wouldn't worry about a post like this being taken seriously by anyone that we would want to welcome as a new resident of our great little town. Sounds like an unhappy Democrat. They like to call others racist to get the attention off of them. Also, what Facebook page is she talking about? I'm a registered Democrat (not voting for Hillary or Trump) and as a Democrat, I have never called others racist, what kind of point are you trying to make? Are you a registered voter? Most often those tossing statements such as this, do not even cast a vote. If your neighbors are complaining about code violations and other quality of life issues, they have every right to do that. Learn to behave as an adult and you won't be treated like a child. We actually stick together because Columbia for some reason always gets a bad rap. We stick up for each other to stand together as a town in whole. Don't judge us based on one person. Also remember you don't know the trials & tribulations others are going through. Just saying. That's a joke too, most of them don't realize they often contradict their own statements! It just sad to attach "racist" to a political party. To my knowledge, both major parties are made up.of all races. To be a racist is due to that person's feelings and should not be labeled to the town. If that person feels like that, move to the deep south of the USA where some of those feelings still exists. Columbia is a town where we may have differences, but WORK together. We are one, Columbia Pride. Columbia is not a racist town by any stretch of the imagination. That being said, there are racist people who live here. Sadly, that is true anywhere. Sooner you move out the better.If you think Columbia is racist, go live on some other "elite" towns in Lancaster and York counties. Columbia is tame. Some people sign a lease you think it's that easy to walk away and lose money. And come up with money for the next security deposit. Some of us are on limited incomes even though we work. Back to the article posted, yes it's very sad to be harassed by marrow minded people. If the Police and Codes found nothing wrong then just chill. Your not the only resident that experiences this treatment in Columbia. Ignore, avoid and have no contact with the pathetic person. If they chose to contact you in anyway call the police. Don't give up. Another jokester!!! Police and codes found nothing wrong, who are you kidding,only yourself! I live here and I don't find Columbia to be a racist town by any means. I believe that people of all races will feel welcomed here. However, I also believe that for many reasons, Columbia PA is not a great place to live. I was sad to hear that Columbia is in the "Top 20" , because I didn't realize that the Country was in such bad shape. But hopefully things will get better in the future when Trump takes over. I think that was visit not live. I'm inclined to agree with the Craiglist post. Racism isn't just about the color of someone's skin. I grew up in Columbia although I moved away thankfully. People there are still doing the same things they did 20 years ago and sadly raising their children to be the same way. I have a handful, probably less, of friends who have either left there as well or who wish they could leave. Columbia is far from some idyllic town to live in. What you all believe is "normal" is nothing more than the definition of insanity. I feel sorry for any one who chooses to move there. There's no revenue, no positive upbringing, and damn sure no realistic opportunities. Say what you want but Columbia would suit better as a ghost town because it has no other use! Let me understand this. All of us in town have raised our children wrong? Boy are you judgmental. Take a long look in the mirror. I have lived outside of this town in several townships. I came back because I chose such. You know nothing about me or my life. There you go judging yet again. I feel sorry for you. Same boat but starting to believe it my have been the wrong decision. Columbia has some very serious problems and the answer is probably COMMUNICATION.